Rate this project Mark Greaves has announced the release of an updated build of Peppermint OS 8, a lightweight distribution based on Lubuntu (the long-term support branch) and featuring the LXDE desktop: "Team Peppermint is pleased to announce the latest iteration of our operating system, Peppermint 8 Respin, which still comes in 32-bit and 64-bit variants, with the 64-bit variant having full UEFI and Secureboot support. 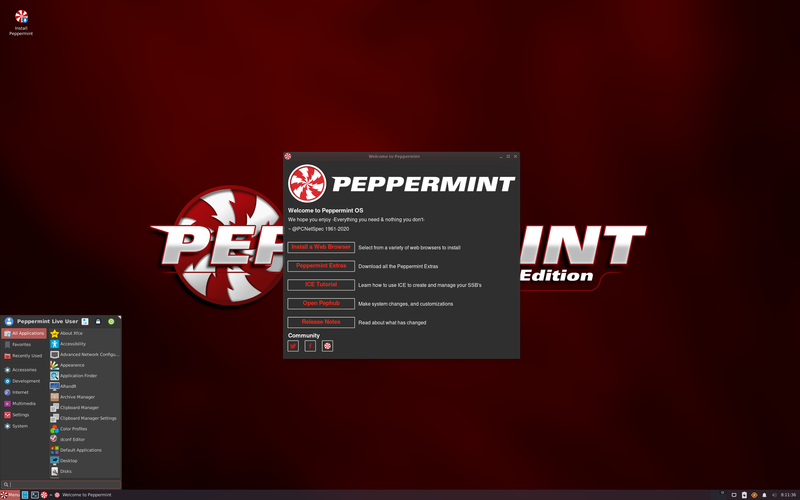 Whilst a respin is generally a minor release intended as an ISO image update, the Peppermint 8 Respin does contain some significant changes: Nemo 2.8.7 updated to 3.4.7 which seems more stable during large file operations and now has a separate process for controlling the desktop; OpenVPN updated in the repository to version 2.4.4 to support mixed mode IPv4/IPv6 VPNs; switched to slick-greeter, a much prettier login screen and a GUI utility in the menu called 'Login Window' for login screen settings, including the ability to add, change, remove an auto-login user; added a desktop right-click 'Open Peppermint Settings Panel' context menu item...." Read the rest of the release announcement for a complete list of changes. Download (SHA256) links: Peppermint-8-20171130-amd64.iso (1,266MB, signature, torrent, pkglist), Peppermint-8-20171130-i386.iso (1,189MB, signature, torrent).